With the right apps, a smartphone or tablet can be a powerful tool for a senior with dementia. 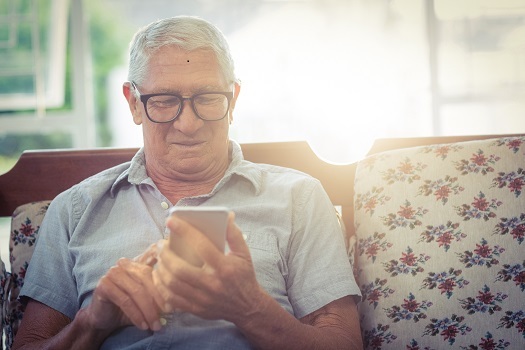 There are now millions of mobile apps on the market, and many of those programs have been designed specifically for seniors with memory issues and other dementia-related symptoms. Here’s a look at six popular apps you might want to download for your aging loved one. The team of developers at Tactus Therapy Solutions created this app for seniors with dementia who have a difficult time recalling important information. Users are asked to memorize small bits of information for set periods, and the timed intervals increase as their memory receives a boost. This app has become very popular among speech pathologists, occupational therapists, and other medical professionals. Seniors with dementia often need assistance with everyday activities so they can age in place in safety and comfort. If your senior loved one has been diagnosed with a serious condition and needs help with tasks like meal prep, transportation, bathing, and grooming, reach out to Home Care Assistance, a leading provider of home care Waterloo, ON, families can trust. We also offer comprehensive care for seniors with dementia, Alzheimer’s, and Parkinson’s. One of the best ways to keep a senior with dementia entertained is to stimulate multiple senses at once. Talking Tom Cat 2 is a lighthearted mobile game that allows users to interact with a cartoon cat. Your loved one will be able to feed, pet, and train the virtual pet by tapping the screen or moving the device around. He or she can also earn gold coins by challenging the cat to simple mini-games. It’s Done! was designed for older adults who sometimes forget to complete important chores. When your loved one first downloads this app, he or she can input tasks such as feeding a pet, taking out the trash, or showering. The app will then send your loved one reminders when it’s time to do those things. Once a task has been completed, your loved one can simply tap the screen to cross it off the list. Aging adults with dementia can live at home safely and optimize their quality of life with the help of highly trained, experienced professional caregivers. If your senior loved one needs professional dementia care, Waterloo caregivers are available around the clock to provide the high-quality care he or she needs. Using the revolutionary Cognitive Therapeutics Method, dementia caregivers can help your loved one stay mentally engaged and delay the progression of the disease. The primary goal of Lumosity is to challenge multiple areas of the brain with simple games and tasks. Learning the basics of this app should only take a few minutes, but mastering each game could take quite a bit of work. Lumosity Mobile is a great option for anyone who would like to boost all their cognitive skills. If your loved one is going to use only one app, you might want to make it MindMate. This comprehensive piece of software has brain games, instructional videos, and links to a wide variety of articles. As an added bonus, it can also be connected to Apple’s HealthKit so your loved one can track his or her daily steps and caloric intake. Gardening is an excellent hobby for older adults, but spending hours outdoors can be exhausting. Flower Garden lets users take care of virtual gardens from the comfort of their own homes. Your loved one will be able to plan out a garden plot, plant seeds, water the soil, and harvest the digital crop. If your loved one is living with dementia, having a trained professional caregiver close by can provide you and your family with much-needed peace of mind. Not every senior has the same care needs, which means they don’t all need the same type of senior home care. Waterloo families can rely on Home Care Assistance to provide individualized care plans to meet your elderly loved one’s unique care needs. Our holistic Balanced Care Method was designed to help seniors focus on healthy lifestyle habits such as eating nutritious foods, exercising regularly, and maintaining strong social ties, and our Cognitive Therapeutics Method offers mentally stimulating activities that can stave off cognitive decline and delay the onset of dementia. To schedule a free in-home consultation, give us a call at (647) 992 0224 today.